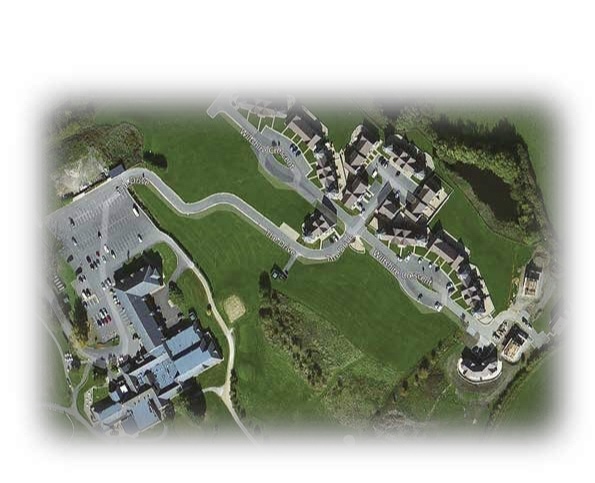 The picture below is a ‘SkySnap’ of Phase 1 of the Wiltshire Leisure and Retirement Village and the adjoining Golf Club and Leisure Centre. All these homes have been completed are and now also have planning for retirement. (See picture below - taken at the start of Phase 2). These houses are mostly owned by residents as second homes who may wish to sell on as retirement homes. WITH NEW PLANNING CONSENT, THE COMPANY IS REFURBISHING SOME SEVEN HOMES AND PUTTING THEM ON THE MARKET AS RETIREMENT HOMES. The house designs consist of the Marlborough (1550 sq), Avebury (1150 sq) and Ridgeway (1050 sq). A new road is also completed, so that the village has its own entrance from the club driveway, creating a secure community. A door-to-door bus service and a cycle pool will be available to all retirement residents. At present, these older properties (10 years since we started this project) are leasehold (with a ground rent that includes two golf and leisure memberships). The Wiltshire Leisure Village is designed for people in retirement who wish to lead a full, independent and active life, have room for visiting friends and families, have space for all those memorable items they have collected through a lifetime and can look forward to the future with pleasure. Seven houses owned by WLV Ltd are now for sale as retirement homes with prices between £220,000 and £275,000. They each have 3 bedrooms and are finished in the Avebury or Ridgeway styles. Each of these houses will include a complete interior decoration and mechanical refurbishment before being sold.